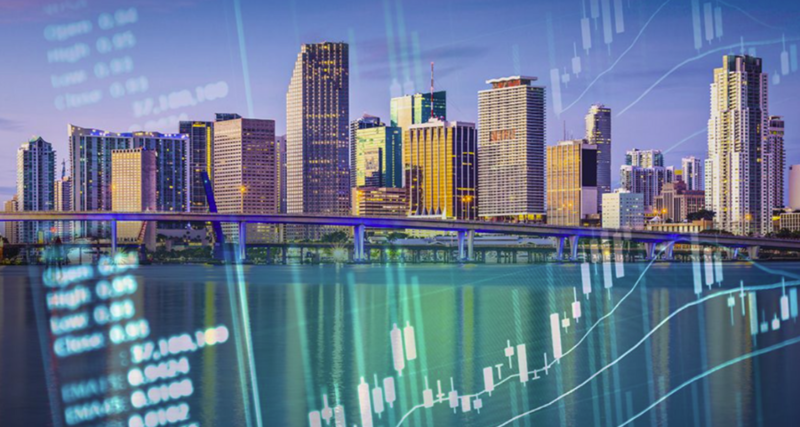 More than 82,000 small businesses employ 53.3 percent of Miami-Dade County’s workforce, according to a new study commissioned by the Florida SBDC at FIU. This stands in sharp contrast to the rest of the U.S., where large companies employ the majority of workers. Produced by the FIU Metropolitan Center, Small Business. Big Impact: Report on Small Businesses in Miami-Dade County 2018 also reveals a high concentration of microbusinesses, those with fewer than 10 employees, in the region. Of six comparison counties studied, Miami-Dade had the highest percentage of microbusinesses, representing 81.3 percent of all businesses in the county. The study, which provides an in-depth look at Miami- Dade County’s small-business establishments, also looks at the wages paid to employees. The average annual wage is $44,803 at a one-employee firm in Miami-Dade and $43,437 in a firm with two to nine employees. However, the average wages were not typical. When looking at the aggregate median wages – a listing of the average wages paid by firms based on company size – half the one-employee companies paid an average wage of $24,000 or less. For businesses with two to nine employees, half the companies had average wages of $30,667 or less. While South Florida is adding new businesses at a rapid rate, those companies are not necessarily producing jobs. The report shows that between 2005 and 2015, the number of non-employer establishments in the Miami-Dade area rose 55.9 percent, almost three times the national rate. Florida SBDC at FIU is the small business development center at the FIU College of Business. The center works with more than 900 entrepreneurs and business owners each year, offering no-cost consulting and guidance on topics including growth acceleration, access to capital and market analysis. TheSmall Business Profiles are produced by the US Small Business Administration’s Office of Advocacy. 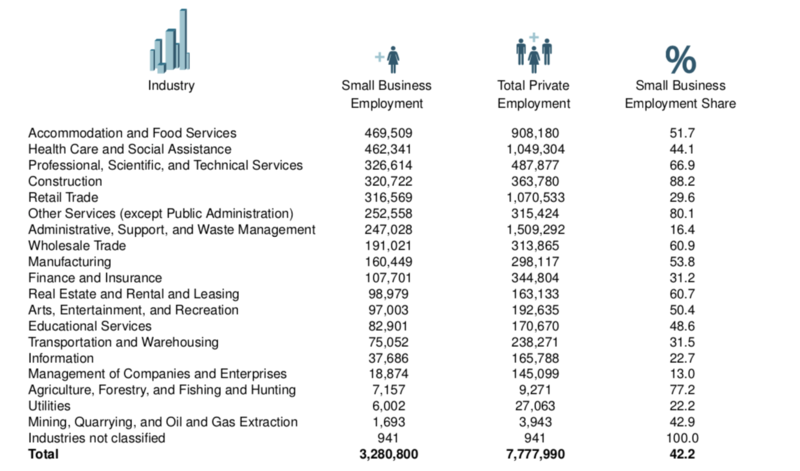 Each report incorporates the most up-to-date government data to present a unique snapshot of small businesses. 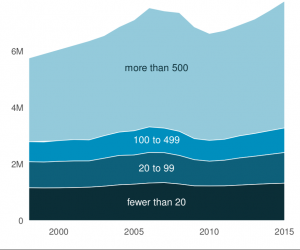 Small businesses are defined for this profile as firms employing fewer than 500 employees. Net small business job change, minority small business ownership, and exporter share statistics are based on the 2015 Statistics of US Businesses (SUSB), 2012 Survey of Business Owners (SBO), and 2015 International Trade Administration (ITA) data, respectively. Median income represents earnings from all sources. Unincorporated self-employment income includes unpaid family workers, a very small percent of the unincorporated self-employed. Figure 2 shows the average number of employees per employer business by owner’s demographic group according to the Annual Survey of Entrepreneurs (ASE). Unshaded bars display US values; data were withheld because they do not meet Census Bureau publication standards or could disclose information regarding individual businesses. The BLS data covers only business establishments with employees. 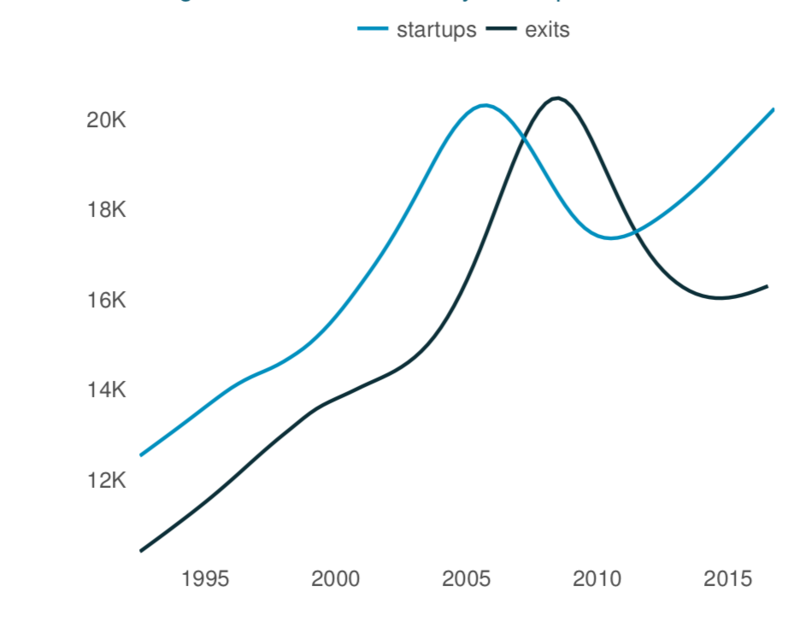 BLS refers to startups as births and exits as deaths. These terms are distinct from the BLS openings and closings categories. Openings include sea­sonal re-openings and closings include seasonal shutterings. Quarterly startup and exit values may not align with Figure 3 due to smoothing. Figure 4 and Tables 1 and 2 display data from the 2015 SUSB. 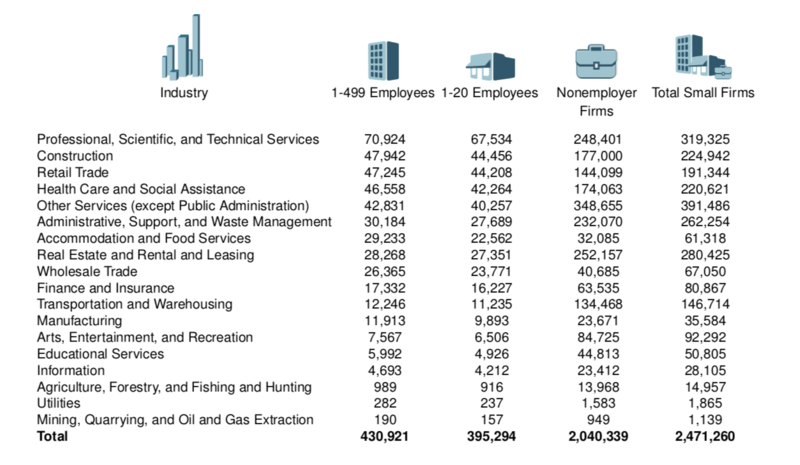 Table 2 includes additional data from the 2015 Nonemployer Statistics (NES). The Small Business Profiles, source data, and methodology are available at https://go.usa.gov/xQT4w. Consider that there are a few hundred thousand companies founded each calendar year in the United States (Bureau of Labor Statistics, 2016), but only ~ four thousand venture capital deals are reported in any given year. Each year between five and six hundred VC-backed entities are acquired, and a few hundred become publicly traded companies (WilmerHale, 2017). That’s honestly not a lot of data, and unless an entrepreneur has access to any of this historical data — or has the time to do the research — they’re pretty much driving blind when making critical decisions. How many months of runway should I target between rounds when pursuing venture capital financing? According to CBInsights, running out of cash is the second leading cause of startup failure. Needless to say—it’s an important question to get right. If an entrepreneur tries to answer this question by triangulating from Google results, they’ll find a few sources that tell them the conventional wisdom is anywhere between 12-to-18 months. 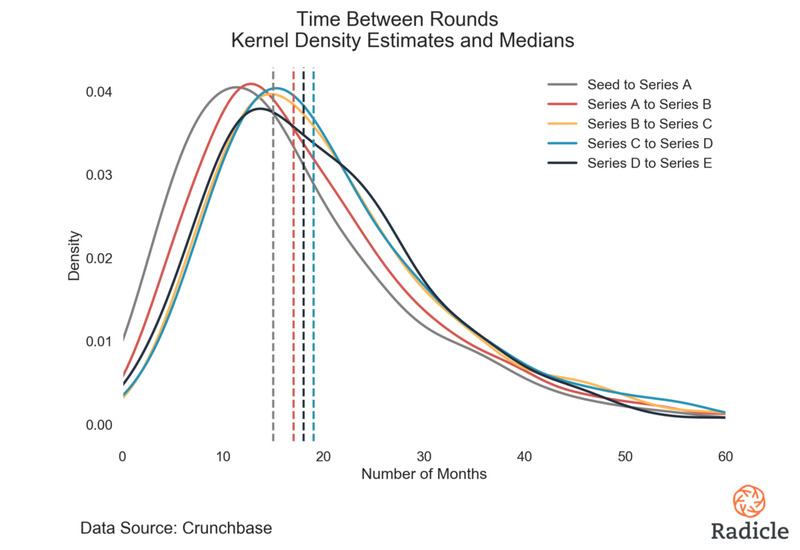 CBInsights estimates the median time lapse between funding rounds for Tech companies to be somewhere in the neighborhood of 12 months for Seed to Series A and 15 months for Series A to Series B. On Quora you’ll find peers, who with no doubt good intentions, also confirm the 12-to-18 month conventional wisdom. Some experienced VCs however, such as Fred Wilson, recommend planning for about 18 months of runway between rounds. Steve McDermid, Corporate Development Partner at A16Z, also suggests being prepared for the process to take longer than one might expect, and to give yourself “plenty of cushion when assessing your cash runway”. So what’s an entrepreneur to do? Is it possible that the startup failure rate is so high partially because conventional wisdom tells founders to prepare for 12-to-18 months between financing events when in reality they should be preparing for longer like the experienced VCs suggest? We ingested all of Crunchbase to find out. To answer this question, I looked at all startups that raised a k round and subsequently raised the following k+1 round in the traditional venture capital sequence. In layman’s terms, that means I segmented by all companies that successfully raised a Seed round, and subsequently raised a Series A. Then I took all companies that raised a Series A and subsequently raised a Series B— independent of whether or not they had previously raised a Seed stage round, or ever raised a Series C in the future—and so on—until the Series E stage. The methodology described above gives us five distinct samples of materialized financing events from the traditional venture capital sequence, which allows us to estimate the average time it takes from one financing round to the next. In statistical terms, that means we’re approximating the population parameter (length of time) which characterizes venture capital financing sequences, by relying on the Law of Large Numbers and sample statistics. In total, we evaluated 13,916 materialized financing sequence events. 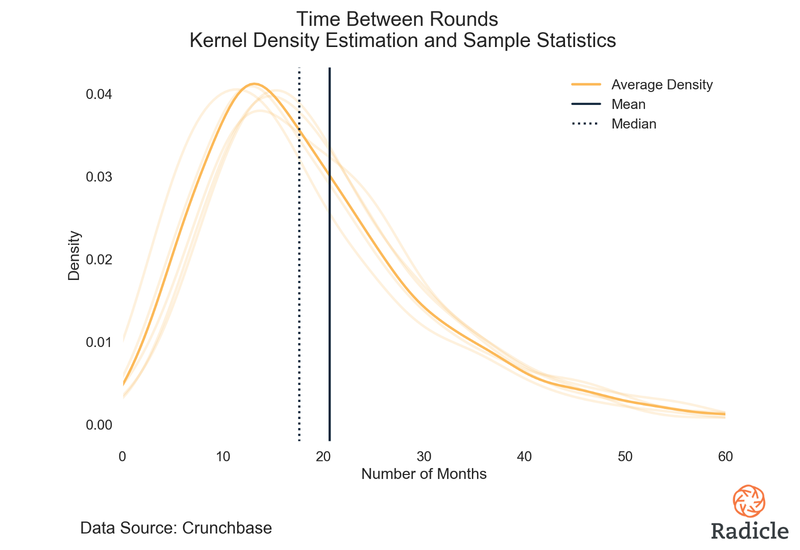 Given the nature of the venture capital funnel and the number of companies that are actually able to raise their next round, this is a more than sufficient sample size for parameter estimation. (Top) Kernel density estimates for 5 distinct funding sequences, with vertical lines indicating the average value for each sequence. (Bottom) Kernel density estimates for 5 distinct funding sequences, with vertical lines indicating the median value for each sequence. Sample sizes — Seed to Series A (n=2623), Series A to Series B (n=5558), Series B to Series C (n=3422), Series C to Series D (n=1644), Series D to Series E (n=669). The general shape of the distributions suggests that the bulk of k+1 financing events take between 5 and 35 months from the prior event (plus/minus one standard deviation from the mean), and the long tails suggest that outliers exist which have taken considerably longer to go from one round to another (as long as 115 months, or 9.6 years!). The presence of outliers also tells us that the average values on the left plot (dashed vertical lines) are misleading, since averages are highly susceptible to outliers. The median is a much more robust measure of central tendency in the presence of outliers, so we should put more emphasis on the medians on the right plot. As perhaps expected, the median time lapse between Seed to Series A is less than the median time lapse between A to B, B to C, C to D, and D to E. Interestingly, the average and median time lapse seems to reach a maximum at the B to C stage, and decreases thereafter. The Series D to Series E distribution is also notably more spread out, which to us suggests that later funding stages are likely more dependent on individual company characteristics. Depending on the financing sequence, the medians indicate an expected value range of 15 to 19 months, while the averages suggest a range from 18 to 22 months. Blending the samples together creates the average density distribution in the plot below, with overall mean and median sample statistics. So, is it possible that the conventional wisdom of 12 to 18 months between financing events is an influential factor leading to high startup failure rates? Yes, because the hard data says entrepreneurs should plan for at least 18–21 months of runway, and as much as ~35 months if they want to play it safe and stay within one standard deviation from the mean. Building a product takes time. Finding the right talent takes time. And it turns out that fundraising takes time, too. 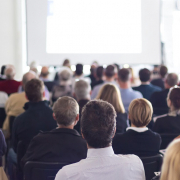 If it takes you less than 18 months to raise another round then great—keep going—but don’t reduce your probability of success by planning for less than 18–21 months of runway between your financing events. Now that we have a good grasp on the time it takes for one round to the next, the question remains: What’s the probability of successfully raising the next round in the sequence? We answer this question in Dissecting startup failure rates by financing stage. https://startup.fiu.edu/wp-content/uploads/2019/01/StartUp-FIU-hrz-Color-rev-ctr_-300x65.png 0 0 Bella Collado https://startup.fiu.edu/wp-content/uploads/2019/01/StartUp-FIU-hrz-Color-rev-ctr_-300x65.png Bella Collado2019-03-13 15:45:032019-03-13 15:49:46How much runway should you target between financing rounds?